Democratic Senator Bill Nelson of Florida is in a tough re-election race against Florida's GOP governor Rick Scott, who is a Trump-Republican. 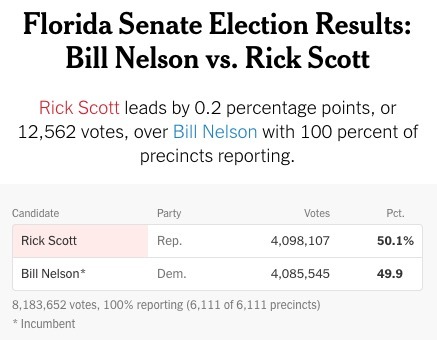 With 100% of the votes in as of November 11, Scott is only ahead by 0.15 percentage points -- that's only 12,000 votes out of 8 million cast -- and the election is now going to a manual recount, where they count every ballot by hand, just as they did in the famous 2000 presidential race. Nelson is pro-choice and rated 100% by NARAL, pro-LGBT, believes in regulating greenhouse gases, is pro- gun control, pro-ACA, and voted NO on Kavanaugh. Rick Scott is awful. He even endorsed Trump in the primary! Scott is anti-abortion, anti-LGBT, anti-ACA, pro-gun with an A- rating from the NRA, and his position on climate change is truly surreal: "I'm not a scientist, so I have no proposal on climate change." 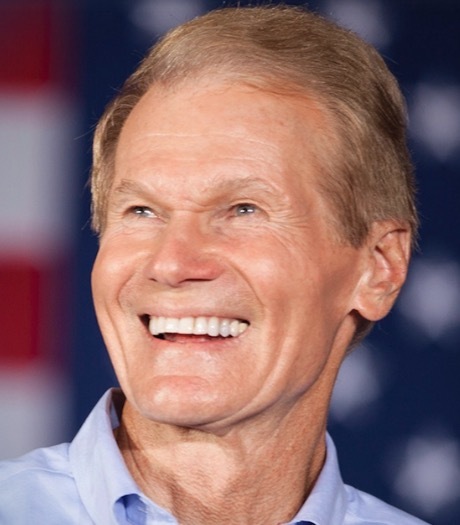 The choice is easy -- support Bill Nelson's reelection. Just imagine the look on Donald Trump's face when he finds out he's lost another race he thought he'd won. That alone is worth it.